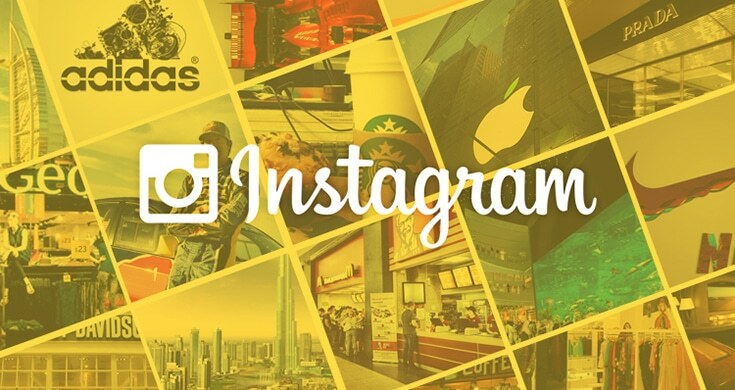 Blog/ Marketing/ How can Instagram fuel your brand’s recognition. We recently wrote an article about the Importance of Social Media for your Business. Lets now continue on how a particular social channel can fuel the brand awareness for your business. It seems like you cannot go anywhere without someone snapping photos these days. People are obsessed with taking selfies everywhere they go, and the best part is that it’s not just limited to teens. We see celebrities engaging in snapping photos of themselves all the time now. Ever since Facebook acquired Instagram for $1 Billion in 2012, the photo sharing platform has seen tremendous growth in its user and content – over 300 million users worldwide. Yep, Instagram is playing a huge role in giving people a platform to share photos with the people they socialize with. Talking in pure business terms, Instagram is a great social platform for brands to connect with their customers, followers and fans on a visual level. The intent of this article is to give you more information about why you should integrate Instagram into your business and your social media strategy. It’s all about how to use Instagram to build up your brand recognition. People do business with people they know, like and trust… that is the simple truth. The days where you can just hide in your office and expect people to frequent your store are long gone. If you do not make your customers believe that you care about them, they will take their business to your competitors. Instagram is a great way to show your customers a side of yourself that they may not see when they come to your store. Do not be afraid to post photos of you and your employees having fun. Showcase your work culture and share a story in pictures. It’s great to showcase your products, but do not just post photos of that. People connect with people more than logos. Here is a brand that is doing this right. Emirates Airlines often reposts some of the pics shared by its staff members on Emirates official Instagram account @emirates. They do a good job in putting a face to all their images rather than showing images of a plane! 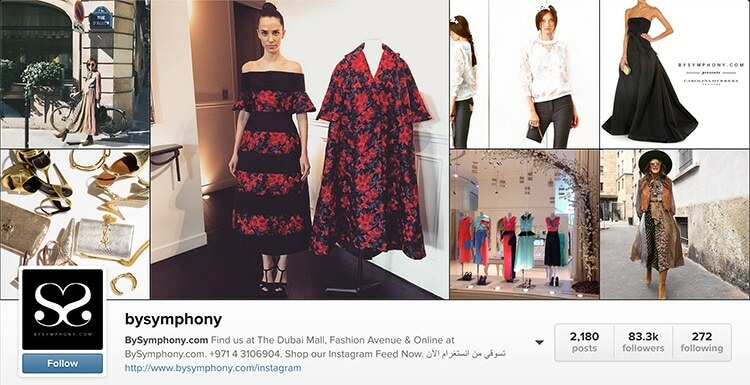 You can use Instagram as a way to thank your loyal customers. You can post a creative image offering a discount or a special offer for the day. Such promotions are showcased instantly to your followers thus giving you a target audience you can further market to based on the redemption. If you want to gain new followers, then make sure you use a hashtag that is easy for people to remember so they can find your promo code easily. 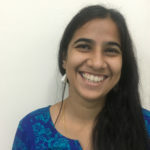 People love sharing information about good deals with their friends, hence its important to have a simple hashtag which can be communicated easily. Moreover, offer the discount only to the followers and verify that they are in fact following your Instagram account. This is a great strategy to gain new customers. Cherry on top – You did not spend a single penny on printing coupons and sending it via direct mail. 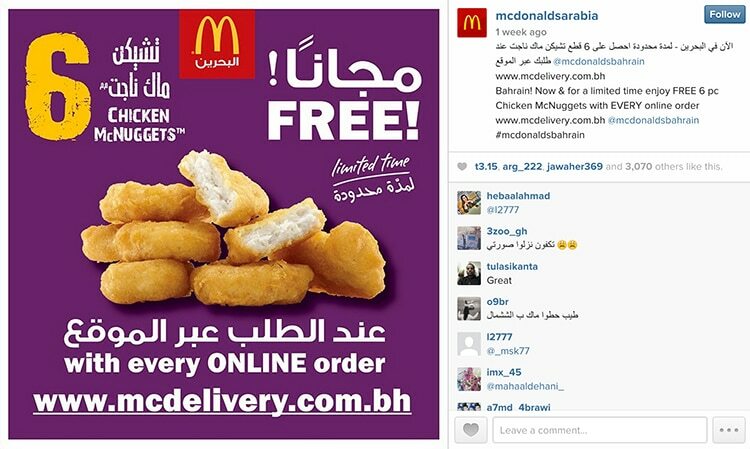 @mcdonaldsarabia is a good example of how this is done. They do a good job by building up their brand and spreading awareness of an offer via this channel. You know when we said above “Do not just post photos of products and logos…”, we did mean ‘just’. So it’s important to note that once in a while you must get the message out there about what is it you exactly sell. A good strategy for this is to engage your customers in the process. Encourage your customers to take photos of themselves using your products and hashtag them with your marketing term. This works really well for hotels and restaurants. Instagram is also great for products. Sometimes potential customers may be skeptical of new products, but seeing your product in a friend’s feed may reassure them of its quality and makes the buying process simple. A great example is posting images of beauty and make up products, or images of a fashion clothing line. So the biggest thing to keep in mind is that Instagram does NOT allow links in the comment. This means that you can’t take a user off from the post on to your website. The intent of Instagram is to bring users to your account and prompt them to follow you based on the quality of content you are sharing. The only way to get found is to add in appropriate hashtags (wait, what is a hashtag!?). Hashtags are keywords or any word you want to associate to your image. This could even be your company name, your product name, a trend, a certain popular acronym or just about anything you want to invent. A hashtag can also be used for special promotions. You could have a deal, where people get a certain percentage off their order if they come in after sharing a certain image about your product with a certain hashtag. However, remember that hashtags should be used sparingly. An overdose of hashtags often causes users to think of the brand as unprofessional and desperate for attention. 2-4 hashtags per post is the ideal number for brands to get noticed yet not drown their audience. Tip: You can always add in commonly used hashtags in comments and remove them after a 24 hour period. This will allow you to get noticed yet still give a clean look and feel to your Instagram page. 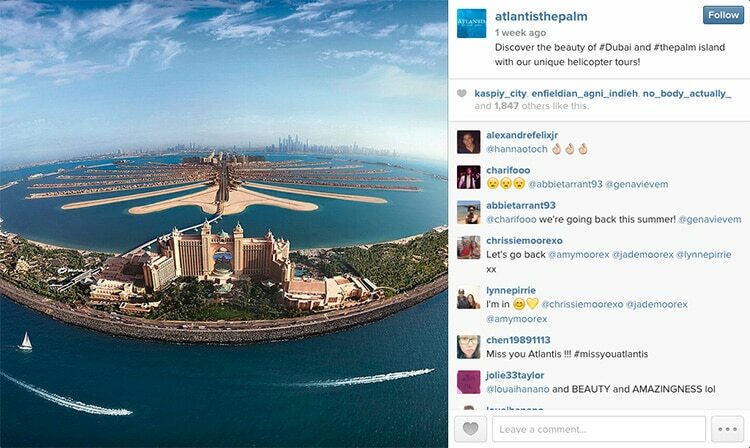 Atlantis, The Palm in Dubai does a good job in tagging relevant hashtags to most of its posts. The Instagram account on @atlantisthepalm has a lot of content about the venue and Atlantis’ various brands, but they make clever use of common search terms in most of their posts. Get an instagram account – its FREE! Be active and post relevant images. Be creative and adopt a certain theme, style or type of photography. Remember to add in relevant hashtags; those that are commonly searched and others that are synonymous with your brand. Time your posts with events. Photo sharing works quite well during live events. Use a good quality camera and share images that are of good quality – remember your brand’s reputation depends on the quality of the asset. If you are interested in knowing more about how Instagram can help your brand, or need more information about the Do’s and Dont’s of Instagram, get in touch with our Social Media Strategist and they will be happy to schedule in a consulting session in Dubai.